Yes, a feline stroke can happen. While they are rare and for many years were not identified as strokes, they do occur. The good news is that they most often are not as serious as human strokes and the prognosis in many cases can be quite good. To illustrate that point, here’s a video that shows the progress a recent feline patient of mine has made since having a stroke a couple of months ago. Her feline stroke initially left her unable to move at all. She couldn’t get up, couldn’t walk, wouldn’t eat, was cold, and looked close to death. In fact, I was called to the home to euthanize the cat. I wish I had a “before” video to show you how she looked right after her stroke, but when a cat looks close to death or I’m not sure if the kitty is going to recover or not, it makes me too sad to take pictures or videos because it is painful to look at them afterwards if they don’t make it. I have another elderly patient who sustained a feline stroke at roughly the same time. Her name is Florence and the following video shows her progress 5 weeks after her stroke. The video includes a conversation between her owner and myself about the initial symptoms, the diagnosis and treatment of Florence. What is a Cat Stroke? In either case, an area of the cat’s brain can be deprived of oxygen or damaged from pressure and a stroke follows. Keep in mind, however, that these symptoms are the symptoms of so many other diseases. Just because your cat has some of all of the above symptoms does not mean she has had a feline stroke. All of the symptoms are serious so an immediate trip to the veterinarian is essential. I know that I say this in almost every article I write, BUT the earlier a diagnosis is made, the better the outcome. In my experience, the most common cause is feline heart disease of some type. It may be feline hypertrophic cardiomyopathy or it may be the type of cat heart problems that accompany hyperthyroidism in cats. Feline hyperthyroidism causes high blood pressure and also causes cat heart disease. Both can lead to strokes, especially if the hyperthyroidism hasn’t been diagnosed or treated or isn’t being managed well. Your veterinarian may be able to arrive at the diagnosis of a feline stroke based just on history and clinical signs. Ruling out other possible causes of the symptoms through bloodwork, urinalysis, and possibly x-rays can be helpful also. The bloodwork MUST include a thyroid test, and x-rays can be useful in determining if the cat’s heart is enlarged. However, for a definitive diagnosis, CT or MRI is needed. In reality, most cat owners do not have this type of testing capability in their area or cannot afford it, so in many, many cases, the diagnosis of a feline stroke is made on the basis of history, physical exam and the ruling out of other diseases through laboratory tests and radiology. 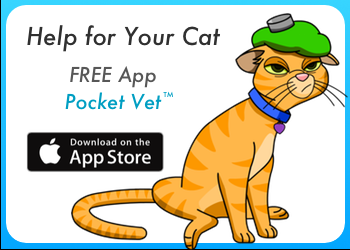 Treatment for a cat stroke is most often supportive (warmth, food, care) although IV fluids may be needed as well as anti-inflammatories, seizure medications, and other treatments as determined by the cat’s needs. If an underlying cause has been determined, then treatment will also be directed at that cause. For example, if feline heart disease has been discovered, then heart medications, dietary changes, and other treatments directed at the underlying heart disease will be prescribed. If the cat has an elevated thyroid level and has been determined to have feline hyperthyroidism, then medication for hyperthyroidism in cats will be prescribed. However, in many cases, an underlying cause is not found and treatment will involve time, patience, and support. Keeping your cat well hydrated, well fed, warm and comfortable goes a long way toward recovery.